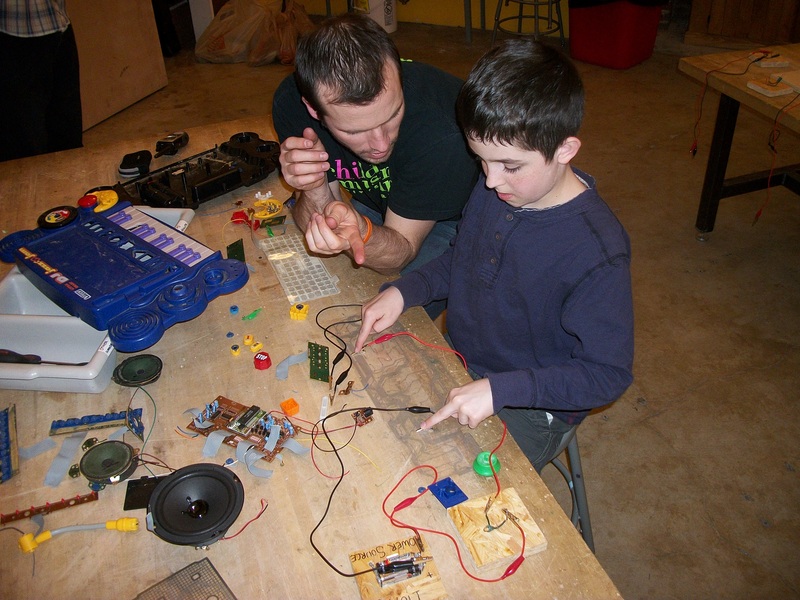 A couple of days ago a visitor, Noah, came into the MakeShop and immediately began playing around with our electric blocks and circuit exploration. One of our Museum Educators, Nick, started a conversation with Noah about the kinds of things he liked to build. He explained to us about a “talk box” (basically that thing Peter Frampton uses to make weird guitar sounds) that he had built. 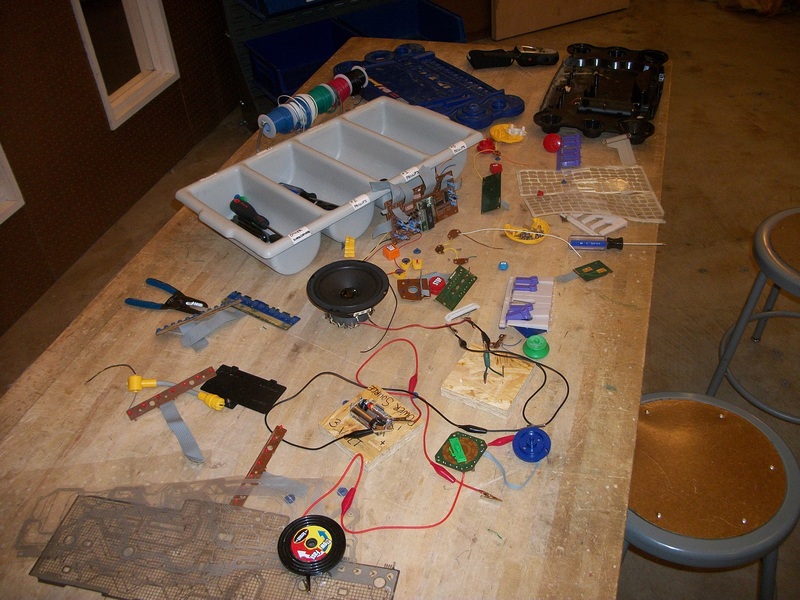 The conversation turned to taking things apart and we showed him some of the old electronics that we had in the Shop. 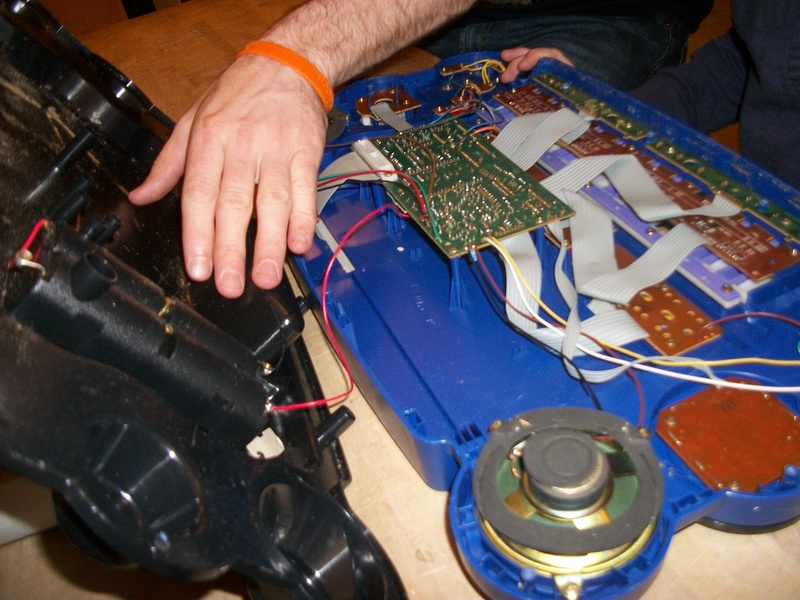 Nick really wanted to take apart this synthesizer that he had found somewhere. The next hour or so was so much fun for myself, Nick, Noah and anyone else who happened to venture into the Shop. Noah told us that his favorite part of taking something apart is the initial opening of the device, we were all very excited to see what the inside of this instrument looked like. I of course immediately wanted to tear the speakers out and see if they still worked; they did! Nick and Noah worked diligently at getting, what we deemed, the “scratch pad” out of the instrument. Its really a lot of fun taking something apart and finding out if any of the components work on their own. The “scratch pad” was very interesting and in taking it apart we gained a better understanding of what was happening beneath the toy’s plastic shell. Noah even suggested that we try putting that element back together and see if we could make it work. Collectively we were able to do just that. 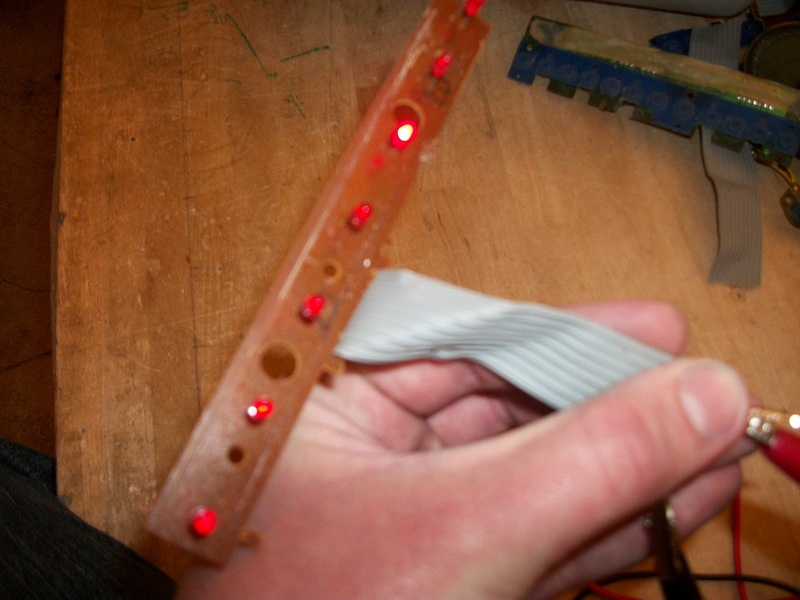 I had a ton of fun playing around with this set of LED lights that Nick and Noah extracted from the synthesizer. Its always a good sign when the staff is having as much if not more fun than the visitors. In the end we disassemble the entire synthesizer and tested out various components to see if they worked. Like I said before, we gained a better understanding of the world around us by simply taking apart an old toy. To see how some of the components inside worked and to explore how to use them in other ways is the exact reason why we have a “take apart” area in the MakeShop. Thanks again to Noah for being so enthusiastic about everything. And thanks to his mom for letting him spend so much time helping us take stuff apart. wow! thanks so much for sharing such a powerful moment!